A modern-day homesteader will tell about her life at 7 p.m. CDT on Thursday, Sept. 11, at the Cultural Heritage Center in Pierre. Rubie Belle, who goes by Miss “V” – The Gypsy Cowbelle, will show and discuss “The Modern Day Homesteader,” the one-hour documentary she produced about her 14-year stay on a remote Wyoming ranch. Everyone is welcome to attend the free program. “This presentation chronicles the oft-forgotten lifestyle of those who settled the West,” said Michael Lewis, president of the South Dakota Historical Society Foundation, which is the nonprofit fundraising partner of the South Dakota State Historical Society. The program is part of the History and Heritage Book Club sponsored by the foundation and helps kick off the Dakota Western Heritage Festival, which takes place on Sept. 13-14 in Fort Pierre. Miss “V” will be a presenter at the festival. During her program at the Cultural Heritage Center, Miss “V” will discuss the life of Elinore Pruitt Stewart, who homesteaded in Wyoming more than 100 years ago. Elinore Pruitt Rupert arrived in Wyoming in 1909, answering Henry Clyde Stewart’s ad for a housekeeper. She filed a claim on land adjoining Clyde’s and soon married him. Published in 1914, Stewart’s “Letters of a Woman Homesteader” tell of her new life in the new country. “She has been a great inspiration, and many of her tales were from the country surrounding the ranch where I spent so many years,” Miss “V” said of Stewart. 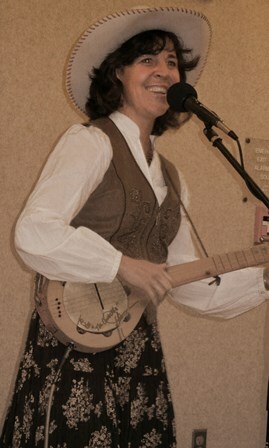 In addition to being a homesteader, Miss “V” is a singer, songwriter and instrument builder. She will open the program with a musical performance and be available for discussion after its conclusion. “Letters of a Woman Homesteader” is available at the Heritage Stores at the Cultural Heritage Center and the Capitol. Book club members receive a 10 percent discount and South Dakota State Historical Society members receive an additional 5 percent discount. For more information about the program, call (605) 773-6006.